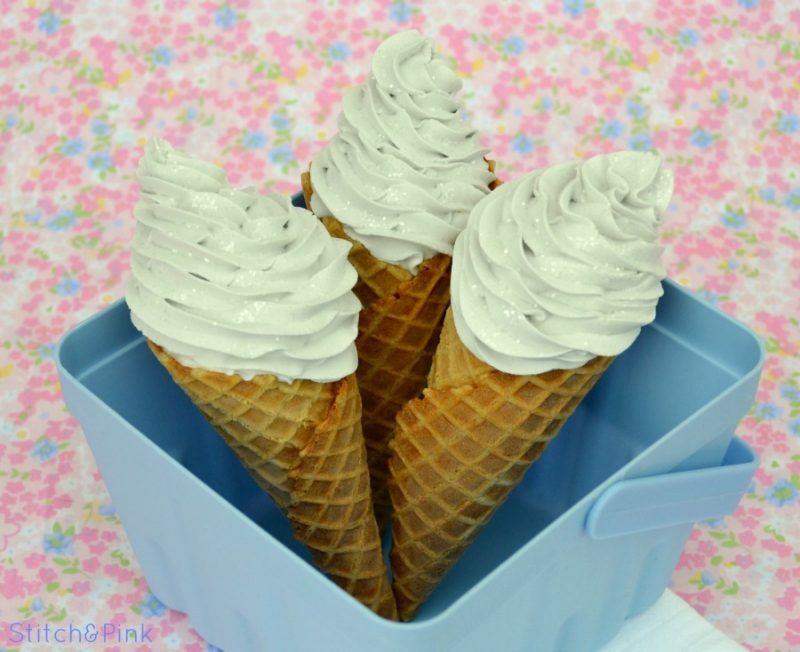 Just curious – Did you happen to notice in all the pics from the Kittens & Cream photoshoot that I was using fake ice cream? I’m sure at least some of you did. I mean I’ve got magic, but even I can’t keep ice cream from melting. . . And where the heck did ya’ll think I got a soft serve machine from in the first place!? Nope, it’s ALL fake, and even better, I made it with something I bet most of you already have hiding in your basement or garage somewhere. Figure it out yet? Yup. Plain ol’ patch that hole in the wall, got it from the hardware store, Spackle. Crazy right!? But if you think about it – It’s the exact same consistency as frosting, so why wouldn’t it work just like it? Let me show you what I did. Steer clear of any of the “pink” kinds. You know, the ones that turn white to let you know they’re dry. It’s gonna be kind of hard to mix the right color with something like that. Add a large blob of spackle to your bowl & mix in the paint. Remember, the color will be darker after it dries, and the more paint you add, the longer that process will take. 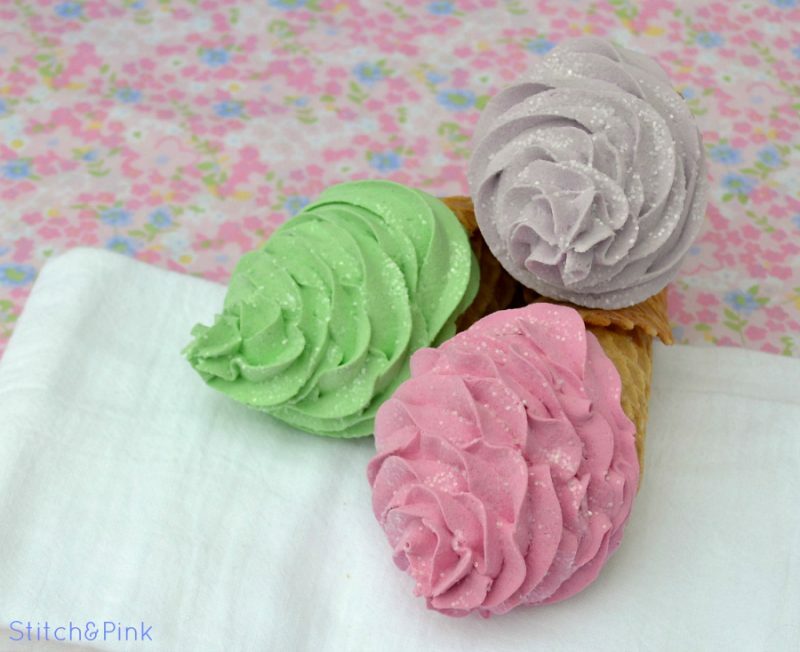 Just like real icing, if it gets too runny it won’t pipe properly. 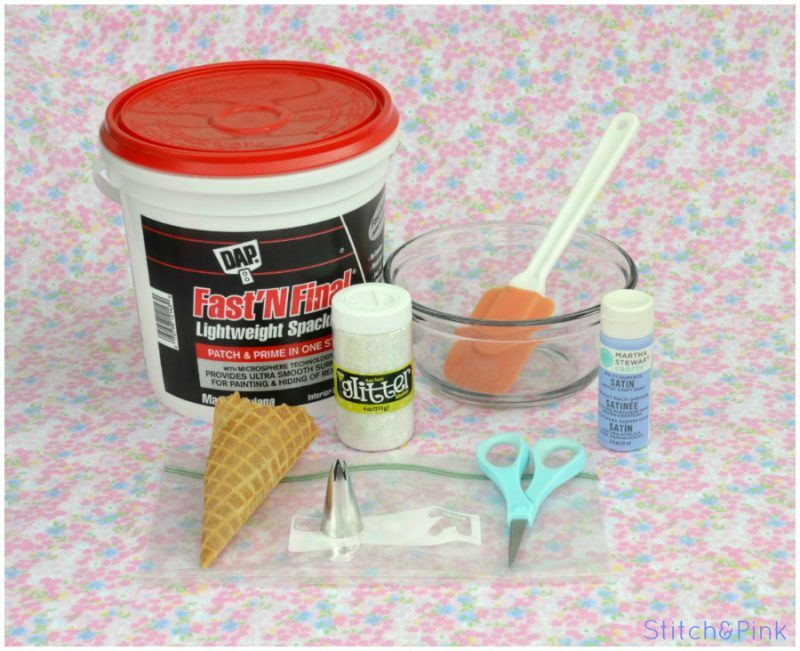 I imagine that you could use plaster of paris mix or possibly grout powder as a thickening agent, if things get too soupy – but don’t hold me to that! You’d have to experiment a little. 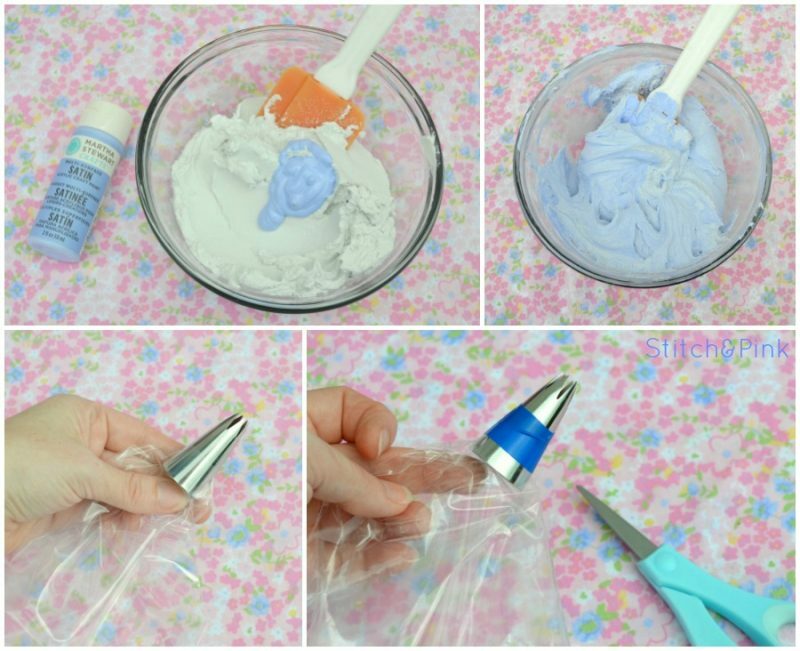 Cut a corner off your ziploc bag, and tape the piping tip securely in place. 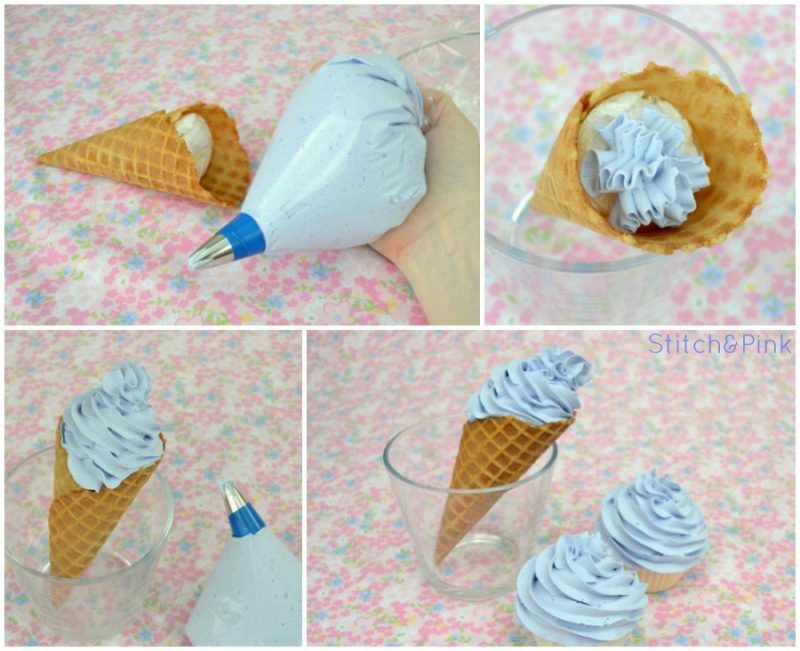 Fill in the bottom of your ice cream cone with…well, anything! Remember what I said about humidity? Well if the spackle isn’t directly touching the cone, then it can’t get soggy right? I just stuffed a few tissues into the bottom of this one & then tucked a tiny piece of plastic wrap over the top too keep them from getting mushy. Sand and packing peanuts are also good options if you’ve got them lying around. 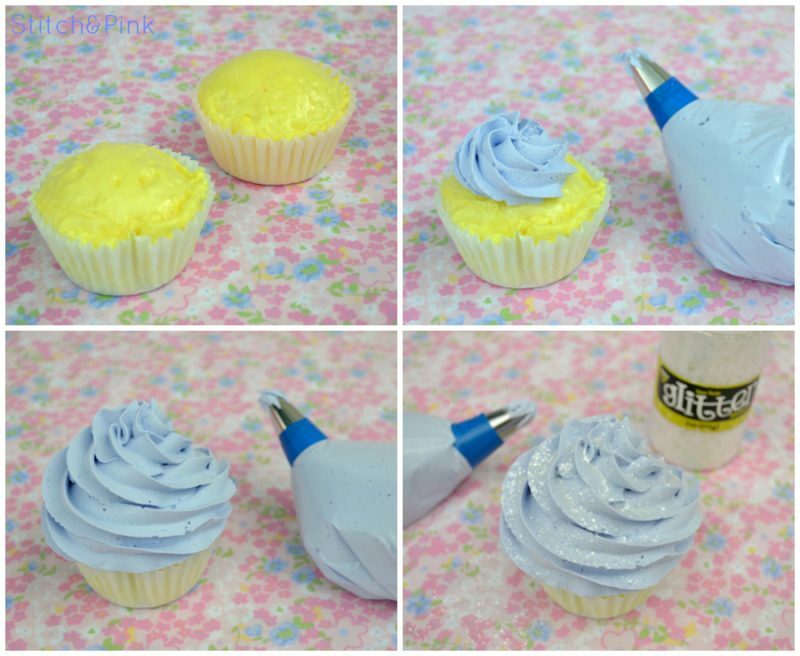 Place your piping bag in a sturdy glass & fill it with spackle. Obviously, you don’t have to but yours in a glass if you don’t want, but I find it’s a heck of a lot less messy that way. 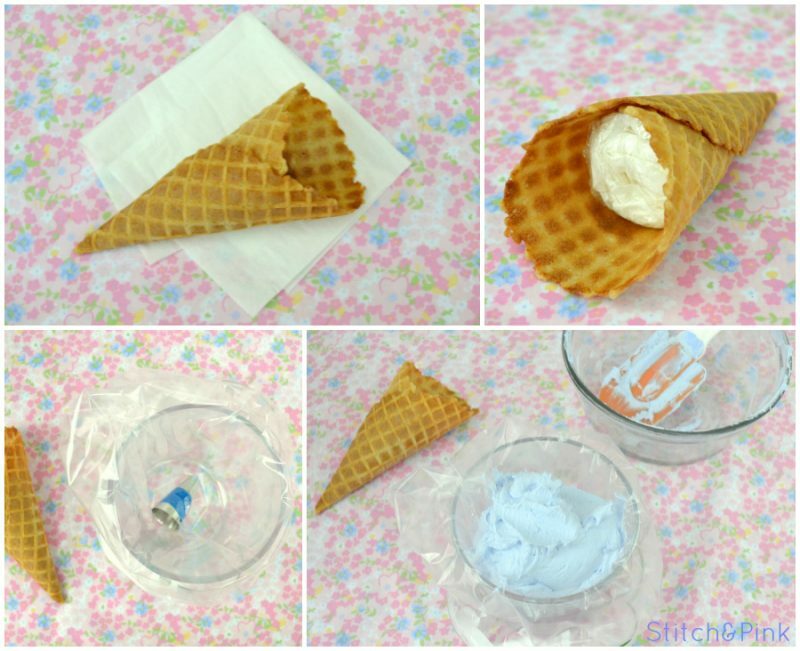 Twist your bag tightly & pipe the spackle into a spiral on top of the cone. I found that making a little blob to build up the center helped to keep the swirl from falling in on itself. And the great thing is – if you mess up, just scoop the spackle back into the bag and try again. The spackle wipes up really easily until it hardens. Ta da! 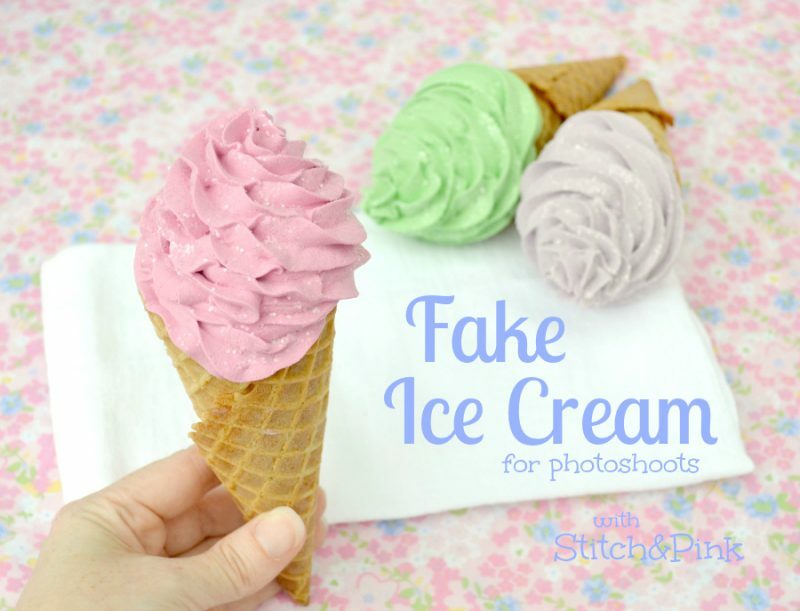 Fake Ice Cream! It’s the exact same process, just without the ice cream cone.